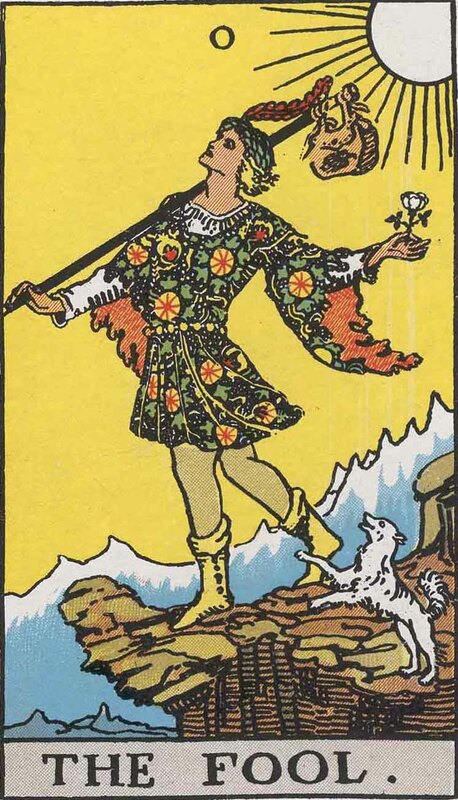 March might seem a long time away, but it’ll be here before we know it … so if you’re in the US North West, or planning a visit there, you might want to check out this year’s North West Tarot Symposium. The big event will be held March 3-5 in Portland, Oregon – a beautiful town with now another great reason to visit. 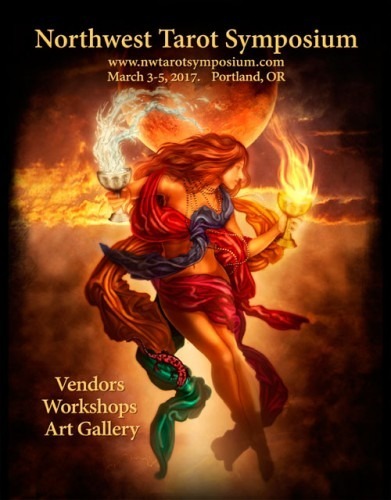 Take a look at the North West Tarot Symposium website to see the schedule and a list of all the fantastic speakers. And if you’re interested in being a vendor, or volunteering, there’s still time! The Tarot Fool has come to life in the small town of Conwy, Wales which recently appointed its first resident Jester in over 700 years. According to rawstory.com, at the beginning of August, Russel Erwood was installed as the Fool of Conwy, and dubbed ‘Erwyd le Fol’ during an official celebration involving falconry, knights, and a parade. To get the job, Erwyd had to prove himself by successfully completing three tasks. He had to juggle daggers while blindfolded, balance a sword on his chin, and make a gold coin disappear. He did them all and more, finishing up his routine with a trick known as The Burning Brushes of Beelzebub where he balanced a burning barbeque on a wooden pole down at the town’s quayside. The last official Fool of Conwy was ‘Tom le Fol’, appointed by King Edward I of England back in 1294. Erwyd’s work duties will be very similar to his predecessor Tom’s – juggling, singing songs, telling stories, and performing magic tricks. I don’t know whether Nelly the Psychic Elephant is right about any of her World Cup predictions, but I love that she predicts by playing a little soccer herself. Take a look at the GeoBeat News video below to see Nelly in action. Apparently, her record’s quite good. If you’re a Toronto resident who hasn’t heard of it already, Doors Open Toronto is a recurring event where residents and visitors get the chance to explore buildings and places across the city we don’t normally get to see. This year, the spring event happens May 24th and 25th, and will provide rare access to more than 155 architecturally, historically, culturally, and socially significant buildings across Toronto. And what’s most interesting to me is that this year’s theme is Secrets and Spirits … Exploring the Mysteries Behind the Door. Secret spaces, spirit sightings, and unexplained mysteries will be highlighted at more than 75 different locations, including an underground church bowling alley, secret tombs, haunted tunnels, and some hotel bank vaults. There will be talks, and art exhibits, and free walking tours. Three ‘ghostly’ tours will be happening – one through the Distillery District, another of the Gibraltar Point Lighthouse at Toronto Harbour, and a third at Exhibition Place. Visit the Doors Open website to learn more. It looks like Marion, Ohio might soon be changing, or maybe even repealing, its ‘fortune-telling’ ordinance. At the moment, ‘fortune-telling’ is technically legal in Marion, but anyone practicing such work would be expected to pay quite a hefty license fee for the privilege. But that may soon change as the Legislation, Codes & Regulations Committee reviews old laws in order to edit or revoke any that might no longer be relevant or useful to the city. ‘Fortune-Telling’ is on their list. I’ll be watching to see what happens, and I’ll share anything I hear. Last week, in a unanimous 9-0 decision, Long Beach, California City Council voted to update their fortune-telling regulations. Though psychic businesses will still need to get a business license to open shop, proprietors will no longer have to undergo a police background check, or come up with a $250,000 bond. There have also been changes made to how ‘fortune tellers’ are defined. Council also removed the requirement of a Conditional Use Permit, and will treat psychic businesses as other personal services, allowing them to operate in commercial zones. It’s official – psychic businesses are legal in La Cañada Flintridge, California. In a 4-0 vote, city council members ruled that fortune-tellers, astrologers, psychics, and palm readers will be included among businesses allowed to operate under the city’s zoning code. Until now, ‘fortune-tellers’ were neither permitted nor forbidden in La Cañada Flintridge, but going forward, anyone interested in opening a psychic shop may do so, as long as they obtain a city permit, and locate within specific commercial zones. According to the La Cañada Valley Sun, though there was some debate last summer, as to whether ‘fortune-telling’ was pure entertainment or a service, council ultimately chose the service label. Presently, it’s illegal to tell fortunes in St. Louis , Missouri, but that could all change soon. According to St. Louis Today, Alderman Shane Cohn has introduced a bill to repeal his city’s rather complicated-sounding ban on divination. Back in 1994, an earlier Alderman made a similar attempt to repeal the law but was unsuccessful. Hopefully, this time round, Alderman Cohn will succeed. You are currently browsing the Newswire category at The Tarot Room.